Herds of stray Greek cows have started invading the southernmost Bulgarian municipality of Kirkovo raising hue and cry by the locals and perhaps even threatening a diplomatic scandal. The unattended herds of as many as 50-60 cows are increasingly entering Bulgaria from Greece systematically destroying local vegetable gardens and crops, reported Darik-Kardzhali. The local people are said to be increasingly concerned but powerless to cope with the new pest and have even likened the stray Greek cows to Moroccan grasshoppers that recently invaded the same region. 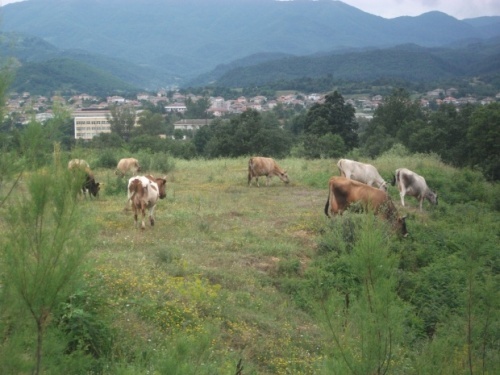 The Kirkovo Municipality, which is located right on the border, has employed three field-keepers who, however, are utterly insufficient to deal with the increasing number of cows encroaching from Greece. In order to tackle the threat, the Mayor of Kirkovo, Shukran Idriz, is said to have decided to organize the hunt of the invaders. The hunting will be carried out municipal employees, border police officers, veterinarians, and any local farmers wishing to join. According to the people in Kirkovo, the cause of the problem with the stray Greek cows is very simple. At the beginning of every year Greek farmers receive subsidies of about EUR 700 per cow. “They take the money and stop caring about the animals, and the Greek state exerts no control on their tending for which it actually allocated the subsidies,” Kirkovo Mayor Shukran Idriz is quoted as saying. She explained the planned manhunt will most likely round up all Greek cows on Bulgarian territory, and if no one shows up to claim them, they will be slaughtered, and the meat will be granted to the poorest residents of the municipality. When asked if she fears causing a diplomatic scandal by initiating the hunt of Greek cows, Mayor Idriz has expressed her hopes that this is not going to happen but emphasized the fact that she is obliged to provide protection to the people in her municipality.